I really liked the navy console table, but it was a little too small for that large wall. I’d planned on flanking it with a couple tall plants, but Ringo vetoed that idea by destroying the fiddle leaf fig that I bought for that spot. Yep, it survived almost a month without even a hint of being touched by doggie lips. 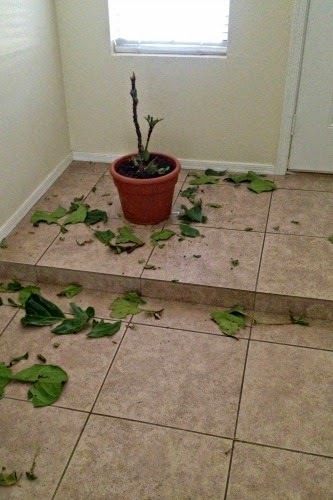 Then one day I came home from work and found whole thing completely destroyed (luckily he didn’t get sick). So, the large plant idea was out. I instantly loved it and wanted it. 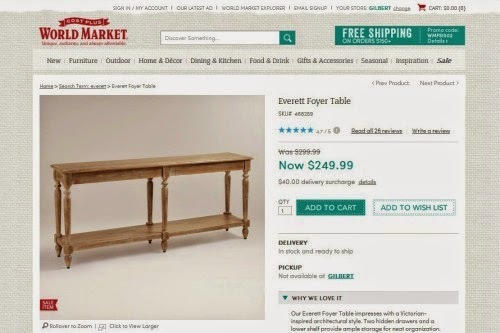 As you can see, it’s from World Market (Everett Foyer Table) so it only took a quick search to find the table. And it was even on sale! So the following day I took a trip to World Market to check out the table in person. I loved it and there was one in stock, so I bought it. My boyfriend wasn’t home at the time and I was too impatient to wait, so I ended up dragging the box inside and putting the table together all by myself. As you can see, it’s about two feet longer and an inch or so taller than the navy table. It fits the space SO much better. I love it! Because the table is bigger, I probably need to get a bigger lamp (maybe 2) and some different decorations. I also want to replace my abstract art with a gallery wall of our travel pictures. I’d also like to add a white bench near the front door. As for the navy end table, for now I’ll probably paint it white to go with the rest of my furniture. Yeah, it’s a bummer that I wasted time and money on a piece just to replace its mate a few weeks later, but oh well. I’ve been stuck on the direction of this room for awhile now (I didn’t love where it was heading), but now I’m motivated again and have a plan! Expect to see more living room projects soon! Oh my gosh...you just made my dreams come true!! 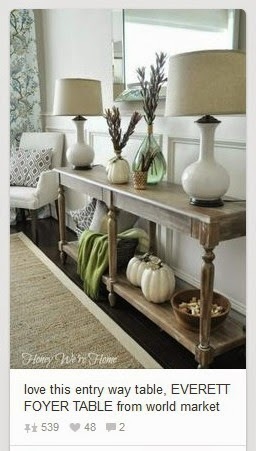 I have also been looking for a longer console table but hadn't found one in my price range. This is perfect. I may go buy it tonight!!! Can't wait to see how you style it!! Glad I could help! I was really excited when I found it too! LOVE that table!! It looks great and can't wait to see how you decorate that area! Have you featured that abstract art piece? I want to see it! Never mind. Found it. I love that piece. Hope you can find another great spot for it. It's beautiful!!! I absolutely love it! Thanks for posting this, is it finished on all four sides or only on the drawer sides? Thank you. It's finished on all four sides!